The co-CEOs of Deutsche Bank, buffeted by high-profile legal troubles, are resigning from their posts atop one of the world's largest financial companies. Anshu Jain and Jürgen Fitschen, who have shared the chief executive job for the past three years, are leaving "early" after an "extraordinary" meeting of the bank's board, Deutsche Bank (DB) announced Sunday. Jain will step down on June 30, but Fitschen will remain in his role until next May "to ensure a smooth transition," the bank said. Both had been expected to run the bank until at least 2017. At the same time, the bank named John Cryan, a member of its board since 2013, to be co-CEO with Fitschen for the time being. Cryan, a longtime banker, will become sole CEO when Fitschen leaves for good. Shares of the bank, which had lost more than 16% of their value in the last two months, were up more than 6% in late morning trading in Germany Monday on the news. 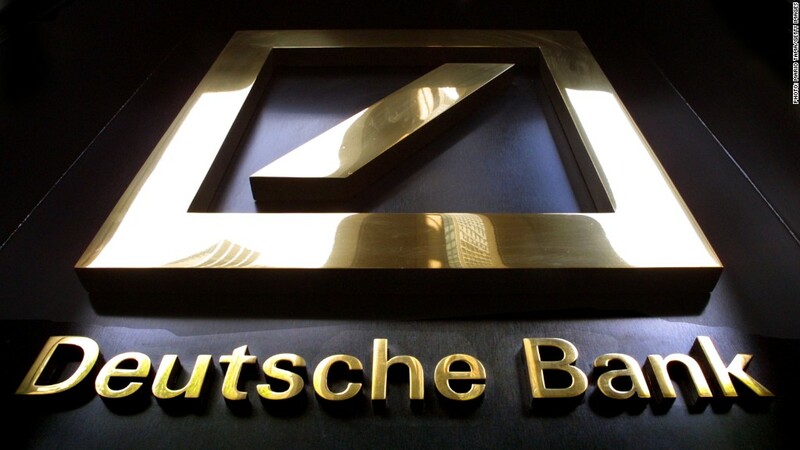 Deutsche Bank, with about 100,000 employees globally, is the largest bank in Germany. It has paid billions of dollars in recent years over various legal claims. The most high profile came in April. The bank pleaded guilty and agreed to pay $2.5 billion to settle U.S. and U.K. charges that it conspired to manipulate benchmarks used to set interest rates worldwide. From at least 2003 to 2010, Deutsche Bank employees used online chats, email and phone calls to arrange for the benchmarks to be moved higher or lower in order to make a trade more profitable.